Mid Bloomer. Flowers in whorls around stem, hairy leaves and stems, 4" to 20” tall, 1/2” dark flowers with white spot. Also called Sky lupine. Notes: Pea family. Among the most familiar and recognizable members of the Pea family. Prefer grassy fields and slopes. 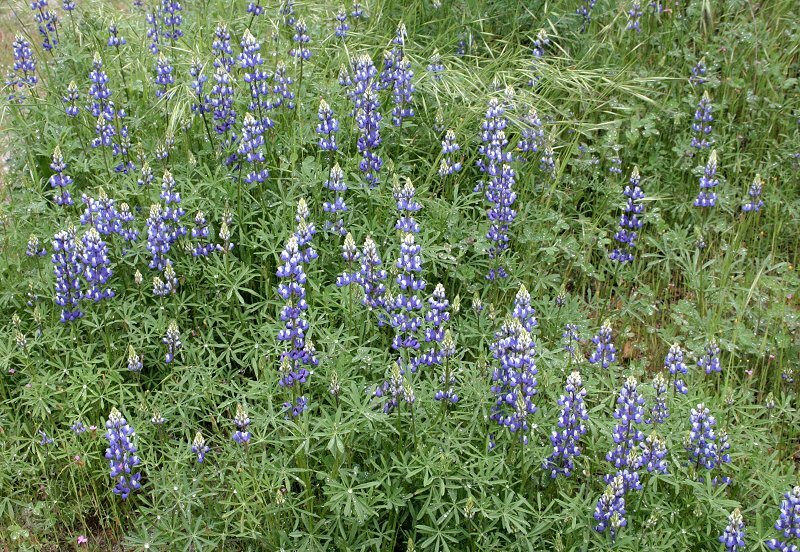 Lupinus nanus is in many ways a typical blue-flowered lupine with hairy palmate leaves and ½” flowers on ½" to 2” stems. The banners (upper petal), however, are low and rounded rather than broader and tall. 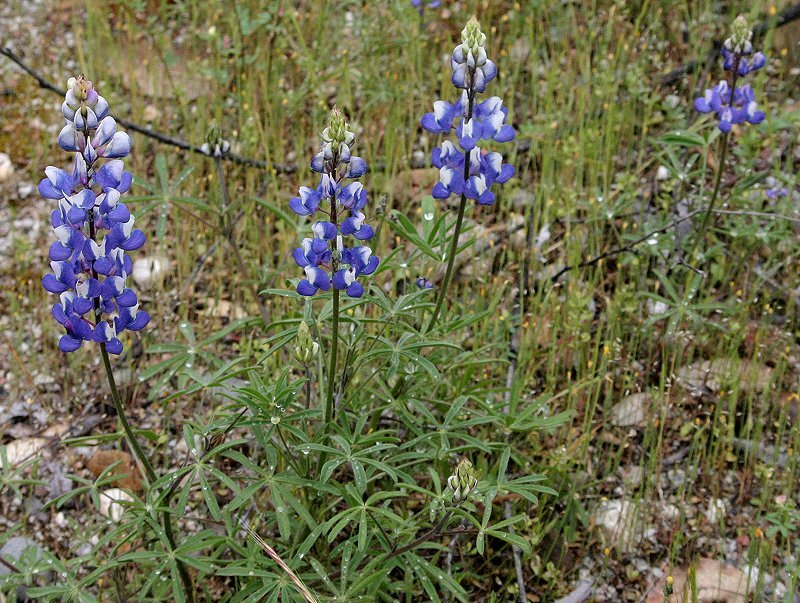 As with many lupine, Lupinus nanus banners are blue with a white splotch in the center, speckled with black spots. 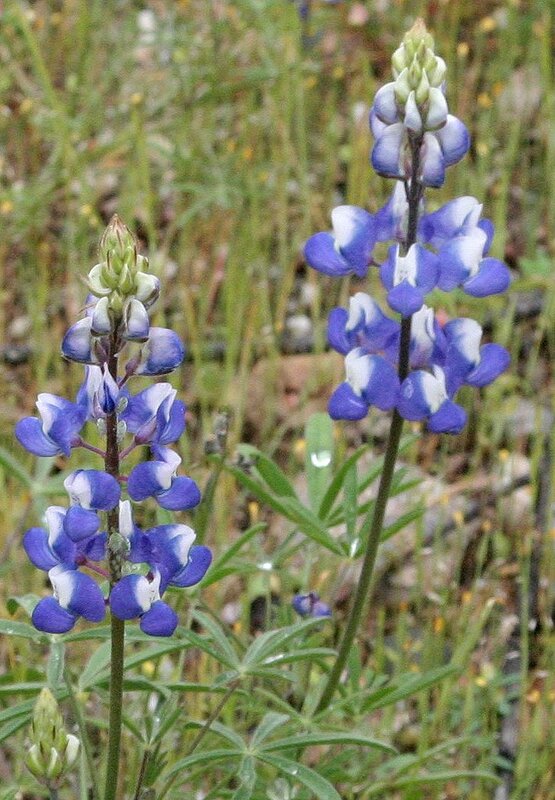 There are about 200 species of lupine; not all are blue. The USDA lists 165 species and 342 accepted taxa overall. Lupinus means “wolf.’ Since lupines and others of the Pea family (Legumes) are nitrogen-fixing, they can grow on quite barren soil where most other plants can’t survive. Apparently those who named these plants thought that the soil was barren because the lupine were stealing (wolfing up) the nutrients from the soil, the way wolves ‘stole’ from their flocks. They didn’t realize that, in fact, the plants were creating their own fertilizer and making it possible for other plants to grow in subsequent seasons. Nanus means ‘dwarf.’ David Douglas was a British horticulturalist and explorer who made three collecting trips to America in the 1820's and 1830's. Many flowers and the Douglas fir are named for him.